Last week our sales team took a trip and visited Tireco's headquarters in Gardena, CA. For many of our employees, this was their first time out to California and even their first time on a plane. This trip gave us the opportunity to build as a team while learning all about Tireco and the Milestar brand. The first day we arrived in California we made sure to hit all of the "must do" tourist spots; of course, this included stopping at In-and-Out burger right after landing. For the rest of the day, we hopped all over, from Los Angeles to Hollywood, Rodeo Drive and finally ended our day with the sunset in Santa Monica. After we toured their warehouse, we traveled to Gardena to visit Tireco's headquarters. During this part of the trip Tireco educated our sales representatives all about Milestar, this specific brand of tires are developed with a focus on outstanding quality and high performance. Milestar is dedicated to providing their dealers with exceptional service and quality products at an outstanding value. There are a couple of things we learned from this trip: California traffic is a real thing, 10 BWT employees in one car can get a little crazy, and Vickie is secretly a Hollywood star! Make sure to get her autograph. Oh, and we love Milestar! One day down and one day to go. 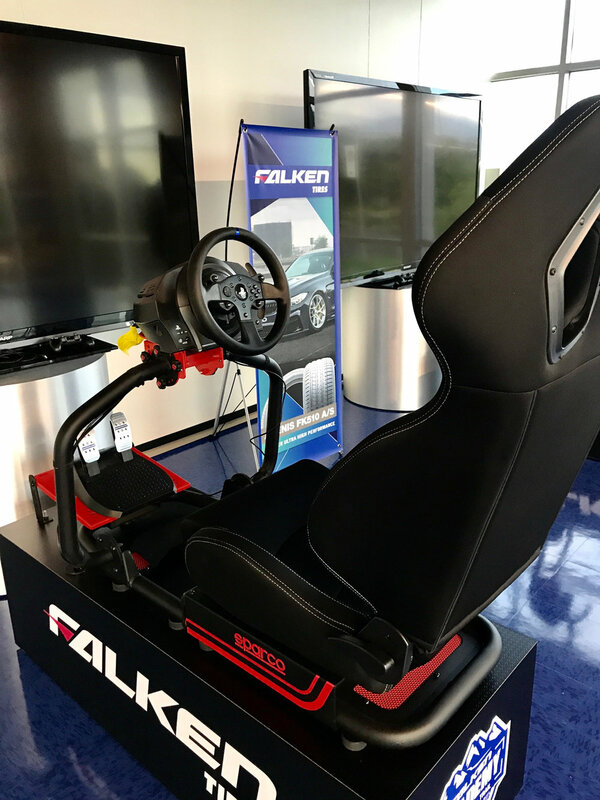 Today I toured Falken's headquarters in Ontario; I was able to see the in's and out's of this corporation, and boy I was impressed. Not only by the brand their advertising but also by the employees their recruiting. Upon arrival, I was greeted by countless employees that live, breath, and bleed Falken. It's great to see a corporation that invests in not only their consumers but also the employees that work hard to create the brand. This passion was shown throughout the day while they taught us the history of their brand, the tires that they carry, and the programs that they offer. They also had an impressive snack/drink selection that I, unfortunately, returned to far too often. Pringles are a weakness of mine. At headquarters, they have completely renovated the second floor of their building for Falken Academy visitors. 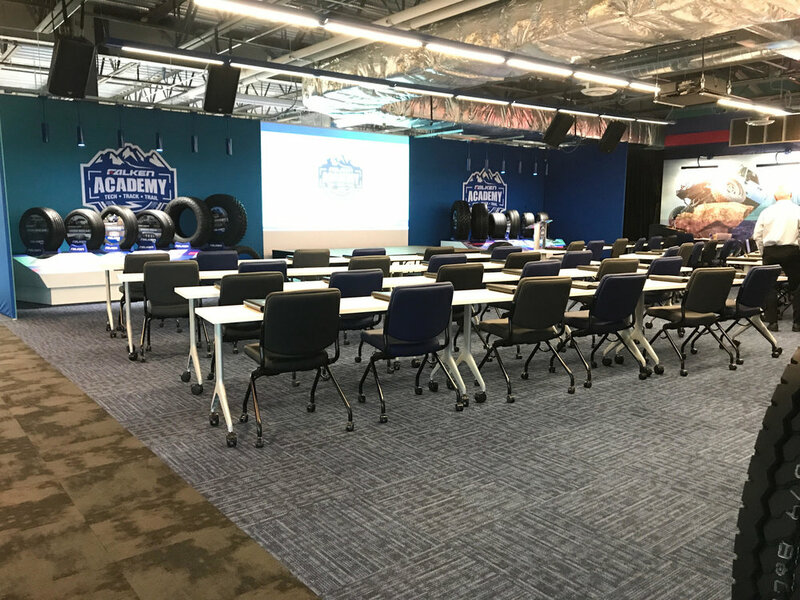 As I walked through this room, I suddenly forget that other brands of tires existed; from marketing merchandise to race track memorabilia, I felt like we were at a training seminar, on steroids. Now that they have educated me about their brand, I'm ready to put their tires to the test. Hopefully, I do a lot better than I did on their race car simulator! Who is Jenn and why is she going to Hollywood? Let me start by introducing myself, my name is Jenn, and I am the Marketing Coordinator here at Barron Tire. The purpose of my blogs is to keep you guys updated on what's going on in the tire world; from new products we carry to sneak peeks on vendor events, I'm the girl for you. Now that I address who I am, I will explain why I am going to Hollywood. In less than a week, I will go from the sandy East Coast of North Florida all the way over to the rocky West coast of California to give you all a sneak peek of what Falken Academy is all about. Falken Academy is holding an all-new Q1 program that gives you a hands-on opportunity to put Falken Tires to the test both on the track and in the dirt. This promotion allows new and existing Fanatic Dealers to win a trip to California for a two-day training event, all you need to do is achieve their "Fan Lite" level, and you will qualify to attend. I will be documenting my whole trip, from test driving at the Auto Club Speedway in Fontana, to getting down and dirty in the mountains to put their WILDPEAK line to the test. My mission is to give you an in-depth look at the latest and greatest that Falken has to offer because this is a trip you do not want to miss.